Police building register of domestic CCTV for crime investigation purposes? 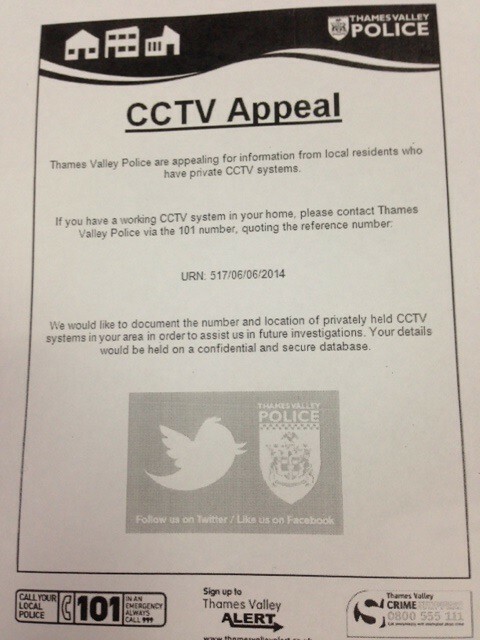 This is a flyer apparently being distributed by Thames Valley Police (TVP). It invites householders who have private CCTV systems to register with TVP, who want to use those systems “in order to assist us in future investigations”. Surveillance camera footage can undoubtedly be of great use in the investigation and prosecution of crime. But there is a potential problem for householders who decided to register with TVP, and I’d be interested to know if the latter have taken this into account. But the corollary of this is that if its use is not purely for the “household purposes” of protecting one’s home from bulgary, then the exemption no longer applies. If householders are determining that the purpose for which they will process personal data is to assist TVP in criminal investigations, then they are data controllers. This can’t simply be TVP wanting a register of CCTV-operating households to assist them if a crime happens on those specific premises, because that would be pointless: in those circumstances the householder would draw the footage to the police’s attention. No, this must be that TVP want to be able to access footage of relevant incidents outwith the individual household. I’ve asked TVP if they have any policy statement or guidelines on this initiative, and will update as and when they reply. At the very least, putting your name on such a list would make it much harder to argue that you’re not just a domestic user of CCTV. Also (wearing a Devil’s Advocate hat of immense proportions), do the homeowners become TVP’s data processors?